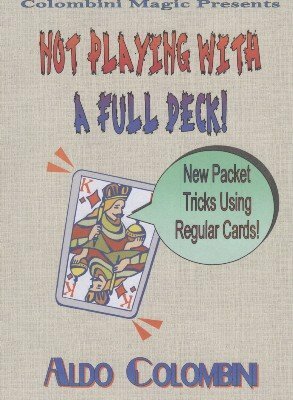 New packet tricks with regular cards. MEXICAN MONTE (Nick Trost): An amusing routine involving two jokers and an Ace, with many changes and a terrific climax where the back of the Ace changes color and a big 'X' appears on the back of the Ace. JAZZY QUEENS AND KINGS (Richard Vollmer): A fantastic packet trick with the four Kings and the four Queens where they change places and at the end the four Aces appear. Great stuff. POLE POSITION (Werner Miller): A card is selected and a spectator loses it in the packet and shuffles the cards. The selection is found by using the name of a random card. UNWONTED (Peter Duffie): An elevator kind of routine using the Ace, Two and Three of one suit and two Jacks. After the cards penetrate the packet, they switch places in the hand of a spectator. SIMPLE OIL AND WATER (Aldo Colombini): Three red cards and three black cards, they mix and un-mix several times with a strong final climax. THE DIAMOND ROBBERY (Peter Kane): Two Jacks and four Diamond cards. The Jacks are 'guarding' two diamonds each but at the end, the four diamonds are together in one packet and the two Jacks in the other. AN ILLOGICAL CONCLUSION (Roy Walton): Four cards are placed on the table, not shown and four red cards are clearly shown. The cards are switched many times and all the cards are shown to be red. At the end, when the audience suspects that all the cards are red, the other packet shows four BLACK cards. Everything can be examined. DEALER'S CHOICE (Karl Fulves): The spectator dictates which cards go to which player, in the end it is seen that he gave the four Kings to himself and the four Aces to you. TWO SURPRISES FOR TWO (Paul Gordon): Two Queens find two selected cards among a packet of cards. HEAT (Cameron Francis): Four black cards are shown, two change into red cards. They mix and separate and then all the cards are black again.